It’s October and that can only mean one thing, it’s time for Santa’s annual interview with the media. Every year Santa sits down with a member of the media to talk about what’s going on in the world, how things are going at the North Pole, and the state of Christmas. This year Santa is sitting down with an up and coming journalist, 7th grader Rose Beckwith of the White River Middle School Gazette. Q: The first thing I would like to do is take a minute to thank you for sitting down with me, Santa. When I submitted my request to Elf Ernest I never imagined that you would actually agree to sit down with me. This should definitely help get me an A in my journalism class. A: Thank for your interest in talking with me. I can tell by how seriously you’re taking this that you’ll do well in your class. If it doesn’t work out, let me know. I can talk to your teacher about it. Q: Thanks Santa, I’ll keep that in mind. I’ve always wondered do the elves have to go to school? What kind of subjects do they study? A: Oh yes. I’m a big believer in education. In fact, at the North Pole we never stop going to school. We spend a lot of time during the off season on schooling, even Mrs. Claus and me. The world is always changing and we have to keep up with it. We attend culture classes, lots of history stuff and current events. But there are workshops as well for new and better ways to make things, how to be more earth friendly in what we make and – oh, the math and the science. We do a lot of math. We learn all the time. Q: You mentioned being more earth friendly; do you still give naughty kids coal? The commercials on TV say that coal is bad. A: No, we don’t do the coal thing. Just too expensive. But coal is not bad. Coal, used properly, is a very useful substance. Nothing that comes from the earth is bad. Q: I was also wondering how do you know if I’ve been good or bad? Do you have spies like the CIA? Satellites like the military? Maybe a magic mirror like in the movie Snow White? A: Oh, heavens no. I know when kids aren’t good because they usually tell me. And if they don’t tell me, well, I still know. You don’t have to walk in the rain to know it is raining. You just know. Q: Well I promise you that I’ve been good this year. I don’t know if I can say the same about my little brother though. In science class a few days ago, we learned that birds have hollow bones that help them fly. Do reindeer have hollow bones? How do they fly without wings? A: No, reindeer do not have hollow bones. They are actually very dense animals, very muscular. But they are trim – very light. Each one is an athlete. To be honest, I don’t know how they actually fly but I would remind you they have four limbs, not two wings, like a bird. And that gives them some sort of edge. We have studied their flight for decades and compared to a bird it is actually a much more complex series of movements and an entirely higher degree of required coordination. A bird is graceful, almost effortless when it flies. They tend to move in bursts and stay aloft by the curved portions of their wings. A reindeer has to be constantly in motion when they fly. Kind of like the difference between a plane and a helicopter. They both fly but they do it differently. Q: To cover the world in one night, you must fly really fast. How fast can the reindeer go? A: It isn’t a question of how fast any one reindeer can fly. It is a question of horsepower. Or, in my case, reindeer power. When I first started with reindeer I only had two who could fly and back in those days it took me weeks to get around the world. But as I found more and more of them that could fly and learned how to care for them and how to train them I’ve been able to perfect the element of speed that gets me around the world in one night. It has taken a long, long time. Estimates of how fast we go in the sleigh are all over the place but I’ve never really clocked it. I’m not worried about speed as much as I am about time. And that is how we measure it here at the North Pole. Our goal is to get it all done by a certain time each year – just in time for Christmas morning anywhere in the world. That is our goal. Q: So not every reindeer could fly. That’s good to know. I thought the one at the zoo was just being lazy. You said that you measure it by time. What’s the fastest time wise that you have ever delivered all of the gifts? A: A world-wide trip with stops everywhere will take from 30 to 32 hours. Just over 30 hours has been my best time. If we ever break 30 hours it’ll be a miracle. Q: While we are talking about the reindeer, why does Rudolph’s nose glow red? Was he bit by a spider like Spiderman? A: That’s a very good question. And I’ll tell you this. Rudolph’s nose only glows when he is flying. And he wasn’t bit by a spider. He was actually injured when he was very young. His nose had to be rebuilt in a way because of his injuries. The doctors we had working on him used bone and skin grafts from other parts of his body to give his nose not only a natural look but also normal function, just so the poor guy could breathe. It wasn’t until we worked him our really hard one day that we noticed the glow, long after he had healed. It seemed the faster he went the brighter the light. It is a combination of speed and exercises that makes Rudolph’s nose so bright. Q: Wow, so it’s kind of like one of those wind up flashlights. The faster you crank it the brighter it glows. Neat. Does it go out then when he lands on people’s roofs? A: Not right away. It’ll glow for a little while and sometimes I have to get him to put his head down so he doesn’t wake anyone up with his brilliant light. Q: Do the reindeer get tired while you are delivering the gifts? Do you give them a break every so often? A: Oh, yes. They don’t like to take breaks. Reindeer are very loyal friends and they are completely dedicated to the cause of Christmas. So they always give me a hard time when I make them rest. I have several teams that we actually use – and thousands more that support our flight every Christmas. I keep herds of reindeer all over the world. That one in your zoo – that’s one of mine. Reindeer are just like elves — you never know which ones you see work for Santa. I have them everywhere. Q: So you mean the reindeer that deliver to my house may not be the ones from the book? A: It depends upon a lot of things. Most of the time the “A” team does the job but I usually rest them a time or two during that long flight – often in warmer climates, where flying is so hard on them. Very rarely am I without my A team in northern territories. Q: That’s good to know. Now I have a few questions about the elves. How many elves are there? I’m guessing that it takes a lot to make that many toys. A: Oh, there are millions of elves around the world and thousands who work at the North Pole. Elves are highly creative craftsmen and I need a lot of them. They come from all over, which is good but we try to take care of kids from all over. Q: Wow that is a lot. Do you make them wear those funny outfits or is that what’s in fashion at the North Pole? A: Like I said, they are highly creative and highly creative people tend to wear outlandish stuff now and then. Elves love clothes. Like so many things they make their own clothes and it is almost a competition some times to see them have something crazy then the next guy you see. We had an elf come to work one day wearing what he called a zipper suit, which was an outfit fashioned all with zippers. He had different colored arms that he could zip on and off. Same with the legs. And he had a pocket attached to his shirt with zippers and he could change the look of that. He called it the ultimate outfit because he could make it fit any occasion. He must have had a hundred different arms for that outfit. Q: That sounds like an outfit Lady Gaga would wear. How about the ears. Do they really have pointy ears? A: A few might. But most don’t. The elves you see in the movies are not like real elves. Real elves can be short or tall, skinny or fat, just like anyone else. One of my elves will not even tell anyone they are an elf, unless they hold an important position at the North Pole. Most elves who work for me do it in secret. And I have them everywhere in the world you can think of. Q: Do the elves ever get in trouble? I would think having Santa around would keep them in line. A: Oh, not real serious trouble. They love fun just like anyone else. Amongst themselves they can be very competitive. It is not unusual to see them engage in contests to see who can wrap the fastest or stuff a stocking the fullest. But real trouble? No, it just doesn’t happen. Elves have hearts of gold. 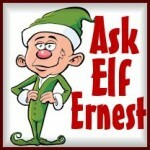 Q: Do the elves like living at the North Pole? Do they ever bug you to move the workshop to some place tropical? A: No, not really. The North Pole is a magical place. It has snow and ice but it really isn’t that cold, especially in the workshop areas. It is a creative environment where things happen that cannot happen anywhere else. At the North Pole, if we want to create an everlasting candy cane, we can. If we want to build a slingshot that can shoot the star to the top of the tree, we’ve got the tools and the talent to do so. Why would they want to move away from that? Q: An everlasting candy cane? I don’t think my dentist would want you to bring me that. What do the elves like to do in their free time? 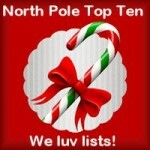 Do you have movie theaters or malls at the North Pole? A: We watch movies on our own TVs, just like anyone else but there are no movie theaters or malls at the North Pole. In fact, there are no stores whatsoever. We don’t have money. We don’t need it. We grow all of our food in the same greenhouses that poinsettias and Christmas oranges are raised in. Every elf has a home and a family at the North Pole and every elf also has his or her own workshop or kitchen or office to have space to create things on their own. We are big on creation at the North Pole. Q: How about Mrs. Claus, does she like living at the North Pole? A: Of course. She’s the queen – well, she’s my queen. Her importance cannot be overstated. There is more work for to do there than there is time to do it. She has responsibility over so many things and has a staff of thousands of elves to help her do it, too. Q: What does Mrs. Claus do at the North Pole? 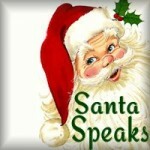 A: Mrs. Claus works the more difficult side of Christmas by helping families and kids with what some call special needs. There are things we need to do for kids with sicknesses or kids who live in difficult circumstances. In that effort the work is year round and Mrs. Claus works it seven days a week. We do a lot of work outside of just Christmas that Mrs. Claus is in charge of that hardly gets much notice. Q: Does she like your beard? My mom didn’t like it when my dad grew a beard. A: Oh she likes my beard very much. But she insists that I keep it just so. I have to trim it every day and I have to be careful to keep food out of it. She is very particular about how I look and is always fussing over this or that. Q: Is she the one who picked out the red suit for you then? A: No, but she is the one who continues to make the red suit work. The red suit comes from my service long, long ago in the Church. We wore red then so that people would recognize we were from the Church. I always liked it and my suit has just stayed that same red color over time. Q: Are Mrs. Claus’s sugar cookies really the best in the world? A: Oh yes. I cannot deny how much I love her cookies. Made with real butter from her own cows and natural sugar cane that she herself raises. There is love in every ingredient. Q: Organic ingredients and love. I’ll have to tell my mom that. Does she ever fly on the sleigh with you? A: Usually on Christmas Eve she joins me in Hawaii as I head north for the last time. But she frequently flies to other places by sleigh with me throughout the year. We don’t have an airport at the North Pole so we take the sleigh to where we can find the cheapest flight to where we want to go on vacation. This year we traveled to St. Thomas for a little time on the beach. We took the sleigh to Montreal, where we then caught a plane. Q: Do people recognize you when you’re on vacation? Do the kids run up to you to tell you what they want? A: Some do. But when I am on vacation about the only thing people can recognize me from is my beard. Other than that I’m just a big guy in a Hawaiian shirt and sandals. 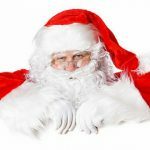 I have noticed that even if folks suspect that I am Santa they remain very respectful of my space and privacy. But I would never turn away a child, never. Q: While we are talking about appearance Santa, why do you sometimes look different from one store to the other? A: Oh, there are a lot of reasons, really. Sometimes I wear a light suit because it gets hot in there. And my hair grows really fast and I have to travel with my barber, Elf Zach. In warmer climates he sometimes trims things a little close to help me stay cool. Q: How do you get into house’s that don’t have a fireplace? A: Through the front door, usually. In fact, I do that in some house with fireplaces, too. It just depends upon where the tree is and who is sleeping where. It is all about speed for me, on Christmas, you know. So I take the most expeditious route I can in every house. If the chimney is faster, then down I go. Q: How do get in through the front door? Do you have a magic key? A: Nope. There is a lot of science involved but let’s let it suffice to say that it has to do with cold nuclear fusion, a technology the world has not quite figured out yet. Through molecular level dissipation we’re able to silently reconfigure the mechanical components into suspended operation and then instantly change them back without noticeable degradation to traditional functioning. Or, in other words, I jimmy the lock. Q: So you’re also a locksmith. Interesting. Do you really eat all of those cookies? Do you ever save some and take them back to Mrs. Claus? A: I wish I could admit to saving them but I just can’t help myself. A lot of Christmas spirit is in a well-made cookie left out for Santa. They make me feel good and I almost never have any left over. Q: Do you have a favorite type of cookie? How about milk? A: I love all kinds of cookies but I love things simple. That is why the sugar cookie is a favorite. Snicker doodles are also to die for. As for milk, of course, I love it. But I love it ice cold. Sometimes I get warm milk on my Christmas ride but that makes me a little sleepy. Q: How do you find kids that have moved since last year or that go on vacation during Christmas? A: You know, they have a way of letting me know. Especially the worried ones. But there have been times I’ve shown up to a house and found no one there. And then I have to hunt around a little bit. Usually kids tell us or the elves will go on a little trip to find out. They are good at detective work, when I need it. Q: Why don’t you always bring kids what they ask for? A: Because I believe in the power of dreams. Some kids ask for things they cannot possibly use or they ask for things that might be dangerous. Sometimes I won’t bring a child what he asks for because the Mom asks me not to and, like a good kid; Santa always does what Mom asks. But the most important thing is that a child needs to continue to dream and work hard. If I just gave every child everything they wanted it would change the value of everything they have. Wanting and dreaming and wishing…those all are Christmas ideals. And I think they are good ones. Q: I guess that makes sense but I really wanted that pony. Santa there seems to be a lot of violence in the world this year. Do you ever get afraid while delivering gifts? A: Well, no. I am very well protected. And I’m well-armed too. Most people don’t know that and I suppose there are some parents out there who wouldn’t appreciate knowing that I’m landing on their roof with nuclear capabilities. I’m sure most residential areas aren’t zoned for that. But I’m only there for a few minutes and they are merely defensive systems any way so the chances of ever having to use them are remote. But those capabilities don’t really have me feeling fearful. I also get a kick out of jet pilots who want to follow my sleigh. I recall once being tailed by some jets over airspace long ago belonging to the former Soviet Union. I played along for a while and let him follow me but I had to get going down into Mongolia and I didn’t need him on my tail so I turned on the afterburners and left him behind. I was listening on the radio and heard the pilot claim he had never seen anything like it. He quickly returned to base and submitted his resignation. I got a chuckle from that. Q: Wow I bet a lot of people didn’t know that. Santa my dad is a huge Chicago Cubs fan like you. He wants to know if you can fill their stockings with 4 leaf clovers and rabbits feet? I think he said you could throw in a couple of horse shoes too. A: Yes, but what they really need is some pitching. I have hope for those guys. I believe in Theo and what he’s trying to do there. I think in a couple of year those kids might just go from really bad to just mediocre. But they’re all good boys, every one of them. Q: Do you think the Cubs will ever reach the World Series in my lifetime? A: Absolutely. I’ve always had hope. And I always will. That’s the beauty of baseball! Q: Do you think people today put too much focus on wanting to be like celebrities instead of trying to be themselves? A: I think some do. The world is suffering economically in many areas and that isn’t always bad news when it comes to character and integrity. When people worry about having a job or enough to eat they tend to focus away from following fads or even embracing celebrities in an unhealthy way. The humility of these times tends to bring out the better in people, I think. Q: Here in the United States, we are having a presidential election this year. Do you ever get involved in politics? Does all of the mean stuff people say cause the amount of naughty kids to go up? A: The amount of naughty kids, no. But the amount of naughty adults, you bet! Folks need to remember that the art of politics is not too much like rooting at a horse race. There is a lot of noise for a period of time but once the winner crosses the line things quiet down. No, I’m not politically active. I have an interest in current events in all countries. I am just grateful for those places where the people have the freedom to make their own choices on their leaders. Q: My school switched from a Christmas break to a winter break this year. Does that upset you? Do you feel like some people our trying to get rid of Christmas? A: Some are but it doesn’t upset me. It would surprise some people to know that I don’t think Christmas overall should be in schools. Not that it is bad or doesn’t belong in the schools. I am of the opinion that schools these days have their hands full with just doing what schools need to do. Kids these days are very bright and educating them is a bigger challenge than ever. I don’t believe they need to be interrupted in their schooling by things like debates about Christmas, football, popular music or fashion. They just need to concentrate on school. So no – it doesn’t surprise me. What surprises me more are those folks who won’t call a Christmas tree a Christmas tree. There is common sense – like calling several days that includes Christmas a Winter break. And then there is just silliness, like calling a Christmas tree something other than a Christmas tree. People, especially adults, can sometimes be so goofy. Q: Do you feel the spirit of Christmas is still as strong as it used to be or has it died off in modern times? A: I think it is stronger than ever. The central message of Christmas is still peace and peace is an idea that people from many philosophies can embrace. And they do. Some people get upset that folks who don’t even practice a religion celebrate Christmas or that others who aren’t even Christian celebrate Christmas. I think that’s wonderful. Christmas is for everyone no matter who they are or where they are from. Q: Santa, it feels like most of the kids my age think Christmas is all about the gifts. It’s about more than that though, right? A: Some do. That’s natural enough. But those who anticipate the season get it. They know it is about giving first. Those who decorate with a twinkle in their eye get it. They give in their own way with their festivity. Those who listen to Christmas music early get it – they give through happy noise with messages of hope, giving and being together. That’s the miracle of Christmas. Whether you celebrate it by singing or sharing music or decorating or preparing foods and just being together with people – that’s all giving. And that is what Christmas is all about. Q: Santa, that sounds like a good place to end our interview. I want to thank you for your time today. I’ve learned a lot of interesting facts and I think the world will too. I have one final question for you though; will you please bring me that pony? I promise to take really good care of it. A: Well, now. We’ll just see what your Mother has to say about that. A pony is a big, big responsibility. This one might come down to the wire so I’d definitely be a good girl all the way through Christmas!